Abilene, Kansas - Visit the Eisenhower Presidential Library & Museum, free Greyhound Hall of Fame, Heritage Center of Dickinson County & Museum of Independent Telephony, Seelye Mansion, Bow Studio & gallery, Lebold Mansion, Abilene's great restaurants, Brown Park Waterfall, Jeffcoat Photography Studio Museum, and the Russell Stover Candies store. Lansing, Kansas - Mount Muncie Cemetery has many famous graves, including the murderers from In Cold Blood. Small, free Lansing Historical Museum has some prison memorabilia. Alma, Kansas - Alma's small downtown contains many beautiful, old stone buildings, including the one which houses the Wabaunsee County Historical Museum. There are also several great specialty food stores. Larned, Kansas - Just a few miles west of Larned is the locally run Santa Fe Trail Center and Fort Larned National Historic Site. The Fort has nine restored buildings from the 1860s and 1870s. The community has also restored the historic State Theatre. Alta Vista, Kansas - Although most people would call the Ag Heritage Park a museum, it is really a personal collection that went out of control. Over 400 agricultural implements, plus household memorabilia and even entire buildings moved to the site by a delightful retired couple. Lawrence, Kansas - Baker Wetlands, Grinter's Sunflower Farm, Natural History Museum & Biodiversity Research Center, Spencer Museum of Art, Dole Institute of Politics, Quantrill's Raid, Watkins Community Museum of History, Naismith Memorial, Prairie Park Nature Center, Schmiedler Grassroots Art, Art Tougeau, Christmas Display Tour, Busker Festival, Booth Hall of Athletics, Bowersock Mills & Power Plant Tour, Haskell Cemetery and Festival of the Nativities. Arkansas City, Kansas - Cherokee Strip and Land Rush Museum hosts many exhibits related to the history of Arkansas City and the surrounding portions of Kansas and Oklahoma. Lebanon, Kansas - The Geographical Center of the Continental United States is located northwest of Lebanon, Kansas. Unlike the nearby World's Largest Ball of Twine, this attraction is even less interesting than it sounds. Atchison, Kansas - The Most Haunted Town In Kansas. Haunted Trolley Tours. You will also want to visit the Muchnic Art Gallery, Cray Historical Home Museum, St. Benedict's Church, St. Benedict's Abbey Church, 1866 St. Pat's Church, Lewis & Clark Sites and the Amelia Earhart Birthplace Museum. Lecompton, Kansas - Founded by 1854 by pro slavery Missourians, Lecompton was intended to become the state capital. Visit the Constitution Hall, and Lane University & Territorial Capitol Museum. Athol, Kansas - The Home on the Range cabin is where the poem, My Western Home, was written. It was later set to music as Home on the Range. Lenexa, Kansas - In June, the Great Lenexa Barbeque Battle (Kansas State BBQ contest) is held at Sar-Ko-Par Trails Park, which also has the Legler Barn Museum. Shawnee Mission Park is the most visited park in the entire state of Kansas. The Lenexa Chili Challenge is in October. Mark your calendar for the Serbian Food Festival at St. George Serbian Orthodox Church. Atwood, Kansas - The Rawlins County Museum depicts rural Kansas history. Its highlight is a mural by Rudolph Wendelin. LeRoy, Kansas - One of Kansas' lesser known gems is Luther's Smokehouse. Luther's produces several varieties of beef, buffalo & turkey jerky, buffalo sausage, and pemmican (lean buffalo roasts ground tender & dried - preserved with raisins). gallery and more than 30 outdoor sculptures created by Franklin L. Jensen. Presently closed, but you can drive by. Kansas Museum of Military History has planes, tanks, trucks, jeeps and helicopters. The Augusta Historical Museum is home to a 1868 Log Cabin and Trading Post Liberal, Kansas - The Mid-America Air Museum displays over 100 aircraft. The 1,268 feet long "Samson of the Cimarron" railroad bridge and its picnic area are a few miles east of town. Dorothy's House, Land of Oz and Coronado Museum are on the south side of town. Baldwin City, Kansas ride the historic Midland Railway or tour the 1864 Osborne Chapel which was moved to Baldwin CIty from Sproxton, England and the Quayle Rare Bible Collection at Baker University with items up to 4,000 years old. Nearby unincorporated Vinland has the Vinland Grange Hall and Coal Creek Library, the oldest library in the state. Lincoln, Kansas - J. R. Dickerman's fabulous Creature Creations form an "Open Range Zoo" along Highway 18. The Cummins Block Building in downtown Lincoln houses the Drug Store Museum and the Post Rock Scout Museum. Baxter Springs, Kansas is the western portal in Kansas for Historic Old Route 66. Attractions include Cafe on the Route and the Baxter Springs Heritage Center. Lindsborg, Kansas was settled by Swedes immigrants in the 1800s. Coronado Heights Park has spectacular views and a WPA stone castle. The Red Barn Studio Museum was the working studio of Lester Raymer. Beeler, Kansas - Two historic markers recognize the George Washington Carver homestead which was located near this small community. Logan, Kansas - The Dane G. Hansen Memorial Museum is more of a community resource than a museum. The Hansen Foundation gives away millions of dollars in scholarships and grants in northwest Kansas each year. Beloit, Kansas - Beloit Falls on the Solomon River is just above Highway 14 near downtown Beloit. The falls is on the edge of Chautauqua Park, a nice little municipal park wedged in a horseshoe formed by the Solomon River. Louisburg, Kansas - Cedar Cove Feline Conservatory & Sanctuary isn't a park, but a place of refuge for large cats. It is open to the public on Weekends. On Saturday nights look through the 30" telescope at Powell Observatory. Beaumont, Kansas - The 1879 Beaumont Hotel is a unique hotel with 3 suites, 8 rooms, a ghost and two dining rooms - one of which is decorated as a 50’s style diner. Manhattan, Kansas has the free Riley County Historical Museum, Marianna Kistler Beach Museum of Art, the fun Sunset Zoo , Flint Hills Discover Center, Wolf House Museum, and Kansas State University's Display Gardens and Insect Zoo. Nearby Fort Riley has many attractions. Deep Creek Waterfall at the Pillsbury Crossing Wildlife Area is southeast of town. Blue Rapids, Kansas - Alcove Spring and Waterfall are located near Independence Crossing, a famous ford where pioneer wagons following the Oregon Trail forded the Big Blue River. Mankato, Kansas - The post rock Jewell County Jail operated from 1899-1982 and can be toured by appointment. It is just a block away from the Jewell County Historical Society Museum. Brookville, Kansas - site of the original Brookville Hotel. Not a tourist destination, but worth a short look if you are passing through town. Marion, Kansas - The Marion Historical Museum occupies a former 1887 Baptist Church, tucked in the corner of the Marion Central Park is the nicest historical museum of its size that I have found in Kansas. District, which is the home of several museums and interesting stores, such as the Kansas Motorcycle Museum, Oil Pump and Marquette Museum & Range School Museum. Kanopolis Lake Waterfall is located in the spillway from Kanopolis Lake. Burdett, Kansas - Rediscover Pluto is a free miniature golf course. It is devoted to Pluto is because Clyde Tombaugh, who discovered Pluto in 1930, spent his teen years on a farm near Burdett and graduated from Burdett High School. McPherson, Kansas - McPherson College is the only school in the country offering a four-year degree in Automotive & Motorcycle Restoration Technology. The McPherson Museum is one of the most interesting local historical society museums in Kansas. Also see the Mid-Kansas Model Railroad Exhibit. Burlingame, Kansas has a old downtown with beautiful 100 year old buildings. The Schuyler museum has a 1938 fire truck and a fabulous toy car collection. Meade, Kansas - The Dalton Gang Hideout and escape tunnel was used by the Daltons in the early 1890s. Meade County Historical Museum has several exhibits unique to the museum. Burlington, Kansas - The Coffey County Historical Museum is housed in one of the most attractive new buildings used by a local historical society in Kansas. Medicine Lodge, Kansas - The beautiful surrounding region of Gypsum Hills or Red Hills will challenge your image of Kansas. The most interesting part of the Stockage Museum and Carry Nation's Home is the many many Carry Nation photos and other memorabilia. Caldwell, Kansas - Drury Dam Waterfall is an overflow falls formed by the 1883 Chikaskia River dam. Drury is an unincorporated community 6 miles east of Caldwell. Mentor, Kansas - Rex Russell's Auto Museum doubles as an automobile themed event space. Caney, Kansas - The Safari Zoological Park is a small private zoo with primates, large cats of several species, bears, wolves, foxes, and tropical birds. Merriam, Kansas -Turkey Creek Waterfall Park is a lovely spot, despite being wedged in between I-35, railroad tracks, and an industrial area. Chapman, Kansas - St. Patrick's Mission Church was constructed in the frontier settlement of Chapman's Creek in the early 1860s. The church was destroyed by a tornado in 2008 and the St. Patrick's Chapel memorial using the original stone was completed in 2010. Minneapolis, Kansas - Rock City is a tiny park which contains about 200 huge Dakota sandstone concretions and a small gift shop. The Ottawa County Historical Museum has a huge collection of George Washington Carver material. Canton, Kansas has side by side "Hot" and "Cold" water towers, and the Maxwell Wildlife Refuge with large wild herds of buffalo and elk - there is an observation tower and on rare occasions, photo tours. Minneola, Kansas - The 1,818 acre Big Basin Prairie Preserve Wildlife Area, 15 miles south of Minneola, Kansas is owned and managed by the Kansas Department of Wildlife and Parks. The Big Basin which is named is a mile wide sinkhole of "sink" which is more than 100's feet deep. Carneiro, Kansas claim to fame is Mushroom Rock State Park which has more of the Dakota sandstone concretions like those found at Rock City. Yes, some of them are shaped like mushrooms. The rocks have been visited by generations who have left the graffiti to prove it. Moline, Kansas - Photos of the 1904 Swinging Bridge and Wildcat Creek Waterfalls in Moline, Kansas. Cawker City, Kansas is the home of the World's Largest Ball of Twine. Or at least one of them. This one grows each August when Cawker City has a twine-a-thon. This attraction is more interesting than it sounds, but then it may not sound very interesting. Montezuma, Kansas - Gray County Wind Farm is the largest wind farm in Kansas. It has 170 turbines with the generating capacity of 112 megawatts. The visitors kiosk is located just east of Montezuma of US Highway 56. Cedar Point, Kansas - The 1875 Drinkwater & Schriver Flour Mill on the Cottonwood River at Cedar Point, Kansas operated for over 100 years. Mullinville, Kansas Kanza Art Studio lines many of the streets with junk metal folk art, windmills and sometimes disturbing political and local religious commentary. The 16 sided Fromme-Birney Round Barn is open at any time, with free admission. Chanute, Kansas - The Martin and Osage Johnson Safari Museum tells the story of the romance of these film pioneers. The Chanute-Wright Brothers Memorial honors engineer and city namesake, Octave Chanute, and the Wright Brothers. New Strawn, Kansas - The Wolf Creek Generating Station is the only nuclear power plant in Kansas. The plant is visible to traffic on Kansas Highway 75 for many miles. Good views of the facility are from Strawn Cemetery. Chapman, Kansas - The Kansas Auto Racing Museum is one of the projects of the Covenant Racing Team. The owners, Doug and Connie Thompson, are a Christian couple who are involved in many aspects of auto racing. Neosho, Kansas - Neosho Falls Waterfall is quite attractive and a popular spot for fishing during low water. Neosho Falls Waterfall is adjacent to Riverside Park. Clements, Kansas - The 1888 Clements Stone Arch Bridge is tucked away in the woods at the edge of a field south of Clements, Kansas. Nicodemus, Kansas was established in July of 1877 and was the largest community established by freed slaves following the Civil War. Nicodemus National Historic Site is free with a visitor center open Wednesday through Monday. Coffeyville, Kansas has the haunted, 1904 Brown Mansion. The Dalton Defenders' Museum, celebrates the defeat of the Dalton Gang, and Elmwood Cemetery has their graves The Perkins Building housed one of the banks they robbed. Learn about the Funk airplane at Coffeyville Aviation Heritage Museum. Norton, Kansas is the home of the free They Also Ran Gallery, which is devoted to Presidential Candidates which lost the election. Colby, Kansas - The 24 acre Prairie Museum of Art and History in includes a 1930s farmstead, sod house, one room school and the Lone Star Church. Oakley, Kansas - The free Fick Museum has large Kansas fossils, old tools, mineral specimens and folk art. The Chalk Pyramids (pictures at the top of this page) are 20 miles south of Oakley off US-83. The pyramids are on undeveloped private range land, giving a feeling of discovering them. Keystone Gallery is a fun combination of fossils, art and souvenirs. Smoky Valley Ranch offers some great hiking trails. Columbus, Kansas - Ted's Old Iron Farm and Museum is at least temporarily closed. The um attempts to take visitors back in time to see Columbus was in the past. Ogallah, Kansas - 12 miles south of Ogallah is the Cedar Bluffs Reservoir with its striking 100 feet tall, cedar covered limestone cliffs. Open year around for camping, fishing and a variety of recreational activities. Colwich, Kansas - St. Mark the Evangelist Catholic Church is a historic Romanesque church which was built from 1903-1906, but has been remodeled and made more ornate over the years. St. Mark was added to the National Register of Historic Places in 1991. Olathe, Kansas - All new Guide to Olathe Restaurants and Attractions includes such attractions as Mahaffie Stagecoach Stop & Farm Historic Site, Ensor Park and Museum, Marra Museum of Deaf History and Deaf Culture. At Christmas time visit the Penguin Playground & Christmas Card Lane. Concordia, Kansas - The restored Brown Grand Theatre is reported as haunted. Tour the Motherhouse of the Sisters of St. Joseph and its Lourdes Park & Grotto . Camp Concordia was a WW2 POW camp. A memorial marks the site of Boston Corbett Dugout which was the home of the man who killed John Wilkes Booth. Our Lady of Perpetual Help Catholic Church is an unusual, castle shaped church. The National Orphan Train Complex tells the story of this 19th century program for orphans. Osawatomie, Kansas - Osawatomie History Museum does a good job of telling the story of the development of Osawatomie. The John Brown Museum contains the cabin of Brown's sister and brother-in-law, a stop on the Underground Railroad. The Osawatomie Driving Tour leads visitors to interesting historical sites. Creamery Bridge & Osawatomie Dam. Osawatomie State Hospital Cemetery. Cottonwood Falls, Kansas - Take a few minutes to enjoy the 1873 Chase County Courthouse, the Cottonwood River Dam & 1914 Arch Bridge, and beautiful Chase Lake Falls. Return in April for the annual Prairie Fire Festival. Oskaloosa, Kansas is the home of Old Jefferson Town, a 10 acre park that includes a blacksmith shop, jail, general store, chapel, school house, Victorian home, and the John Steuart Curry boyhood home & museum. Council Grove, Kansas - The Kaw Mission dates from 1851. The Hays House restaurant has been in continuous operation since it opened in 1857. The Kaw Nation recently opened Allegawaho Heritage Memorial Park. Trial Days Bakery Cafe is a restaurant and museum. Lake Kahola Waterfall is one of the most beautiful in Kansas. Oswego, Kansas - Little Town Well in John A. Mathews Park was the site of one of the first white settlements in southeast Kansas. 90 acre Riverside Park overlooks the historic Neosho Crossing and Neosho River Falls. Damar, Kansas - The beautiful, romanesque St. Joseph Church was built from limestone quarried at Waldo, Kansas from 1913-1917 at a cost of $30,000. The large building with twin 100' spires dominates the small community. Ottawa, Kansas - Ottawa is the northern terminus of the 33 mile Prairie Spirit Rail Trail which offers hiking and bicycling. Pome on the Range Orchard and Winery 6 miles south of Ottawa off I-35 at Exit 176 offers produce, Kansas foods and wines. The Old Depot Museum is in a beautiful 1888 building. Franklin County Courthouse. Danville was constructed from 1904 to 1907. Overland Park, Kansas - All new Guide to Overland Park Restaurants and Attractions includes such major attractions as the The Overland Park Arboretum and Botanical Gardens, Deanna Rose Children's Farmstead and the Nerman Museum of Contemporary Art. Delphos, Kansas - The Grace Bedell Billings: Lincoln's Little Correspondent Monument is dedicated to the 11 year old girl who wrote to Abraham Lincoln asking him to let his whiskers grow. Park, Kansas - Sacred Heart Catholic Church in tiny Park City has dominated this western Kansas countryside since 1923. Today the church steeple is visible from I-70 for miles. Derby, Kansas - Field Station: Dinosaurs is the newest Kansas theme park, having opened in May 2018. The 14 acre, suburban Wichita park has 44 life sized animatronic dinosaurs. Parsons, Kansas - The Antietam Circles at Oakwood Cemetery are a must visit for Civil War and cemetery buffs. DeSoto, Kansas - Grandpa's Garage and Body Shop is a 1918 Model T Garage where Dean Weller turns old automobile parts and sheet of metal into works of art. Pawnee Rock, Kansas - Pawnee Rock is a sandstone hill that was a landmark near the halfway point on the Santa Fe Trail. Today, the rock is topped with memorial markers, a picnic area and a pergola - a viewing pavilion with a roof top lookout. Dexter, Kansas - Although the dramatic Waterfall at Cowley State Fishing Lake is less than 1/4 mile off US Highway 166, it is virtually unknown and visited by only a few people each day. Pfeifer, Kansas - Holy Cross Shrine is a magnificent former 1918 post rock church with a 165' spire. Nearby Holy Cross Cemetery has many ornate Volga German iron crosses. Dodge City, Kansas - Free, Fort Dodge (now the Kansas Soldiers' Home) is 5 miles east of town. Wagon ruts on the Santa Fe Trail are 9 miles west of town on Highway 50. Dodge City also has the tiny Wright Park Zoo and the 911 Liberty Garden Memorial. Pilsen, Kansas - St. John Nepomucene Catholic Church is a beautiful church that with a steeple that stands 111' above the surrounding area. Tours are also available of the adjacent museum devoted to Father Emil J. Kapaun, who has started the process toward being declared a saint. Dover, Kansas - Echo Cliff Park , southwest of Dover in an area once known as Gibbsville, is cool little park owned by the Echo Cliff Park Trust. The park area was cleared the 1920's and eventually deeded to the Dover Grange to be preserved for the public. Piqua, Kansas - Beautiful old St Martin's Church is no longer used for services, but is still open to the public for viewing or meditation. Also visit St Martin's Cemetery behind the church. The Buster Keaton Museum is open weekdays in the front room of the Piqua Water Department. Not bad for a community of about 100 people! Elk Falls, Kansas is a town of less than 200 people that bills itself as the World's Largest Living Ghost Town. There is an 1893 Iron Truss Bridge and the falls the community was named for, an annual Outhouse Tour, Outhouse Grove, and two historic markers devoted to former resident Prudence Crandall. Prairie Village, Kansas -A quiet cul-de-sac near Corinth Square is the final resting place of Lawrin, the only Kentucky Derby winning horse to have been bred and raised in Kansas. Candy Cane Lane has every house decorated at Christmas. Johnson County Christmas Tour. Elkhart, Kansas - Eight Mile Corner is the Tristate Point for Kansas, Oklahoma and Colorado. It is marked with a brass marker and there is a nearby prairie dog town. Pratt, Kansas - Pratt Education Center, Aquariums & Fish Hatchery is operated by the Kansas Department of Wildlife and Parks. Exhibits display both living and preserved native birds, fish, mammals, and reptiles. Includes twelve 400-600 gallon aquariums. Ellinwood, Kansas - You can tour the Underground World, a small remainder of the underground businesses and walkway that once lay below the downtown. Tours start from the haunted 1894 Wolf Hotel. Quinter, Kansas - Castle Rock is about 13 miles south of I-70 near Quinter. Interesting chalk formation on private range land open to the public. The nearby "badlands" is even more interesting. The "Castle" is crumbling with time. Castle Rock has very few visitors, but is really something special! Ellis, Kansas has the modest Ellis Railroad Museum and miniature train and the even more modest Walter P. Chrysler Boyhood Home and Museum. The community should be commended for keeping these museums open year round, despite the small number of visitors during the winter. Republic, Kansas - The Pawnee Indian Museum State Historic Site is built around an excavated 1820s Pawnee earth lodge. It was part of a walled community of around 40 lodges with a population of 1,000 Native Americans. Elsmore, Kansas - Bourbon Lake Falls, 4 miles east of town is a spectacular seasonal waterfall from spring until mid summer. Rice, Kansas - The Rice stone arch bridge was built in 1899 and restored in 1990. A cottonwood tree with a circumference of 23 feet stands next to the almost hidden stone bridge. Emmeram, Kansas - 1901 Sacred Heart Church was destroyed in a fire on October 12, 1998, but the ruins are quite picturesque. Rose Hill , Kansas - Jurassic Art has dozens of welded grassroots art creations by Phil Brinkley. Emporia, Kansas is famous for William Allen White, publisher of the Emporia Gazette, which has a tiny free museum of old newspaper equipment. Lake Kahola Waterfall is northwest of town. The Emporia Zoo, Soden's Dam Falls and Lyon County Historical Museum are free, as are the Johnston Geology Museum & Schmidt Museum of Natural History on the campus of Emporia State University. Riverton, Kansas - Cruise Historic Route 66 through southeast Kansas and be sure to stop at Eisler Bros. Old Riverton Store, a local market since 1925. Empire Power Dam Falls is the most impressive water feature which I have seen in Kansas. Erie, Kansas - The wonderful metal sculptures of Dinosaur Not So National Park have moved to a new Erie Dinosaur Park. The first Neosho River Bridge was constructed in the early 1870s, as was the dam below the bridge. Russell, Kansas - The Gernon House museum is the oldest stone house remaining in Russell. The Heym-Oliver House is another classic old stone house. Prairiesta is a celebration of history, heritage, and culture that has been held every ten years since 1941and includes a huge Prairiesta Parade. Eudora, Kansas - The Eudora Community Museum is maintained by the Eudora Area Historical Society and for several years was located in the former Nottingham Elementary School building on the south side of town. Following 2 years of rehabilitation, the museum moved into a historic building in downtown Eudora in 2015. Russell Springs, Kansas - The Butterfield Trail Museum occupies the former Logan County Courthouse. The beautiful renaissance-style building was built from native stone and brick in 1887. Eureka, Kansas - The Greenwood County Historical Society Museum is a significant genealogical resource for people researching ancestors. During high water, the Eureka Lake Waterfall is one of the most impressive in the state. Eureka Spring was discovered in 1857. Sabetha, Kansas - The Albany Historical Museum has 15 buildings and a large collection of farm machinery and antique vehicles. Old Albany Days is held at the museum on the weekend following Labor Day. Fairway, Kansas - The Shawnee Indian Mission was a Native American school and the territorial capital where the "bogus laws" were passed. Three buildings date from 1839-45. Shawnee Methodist Mission Cemetery. St. Benedict, Kansas - The 1894 St. Mary's Church interior is decorated with so much art that it is almost too much to take in. Florence, Kansas - This community of only 112 people has done a lovely job of restoring the Harvey House Museum. Open only by appointment. St. Francis, Kansas - The welded metal sculptures created by the late Harvey Walz are a hoot. See other sculptures at the Cherry Creek Encampment memorial. Tour Three Corners, Arikaree Breaks and Horse Thief Cave. Fort Scott, Kansas - Fort Scott National Cemetery was one of the first 12 National Cemeteries. It has many unusual graves. Other attractions include Rock Creek Lake Waterfall, Fort Scott National Historic Site, Gordon Parks Museum, the Gordon Parks Collection at Mercy Health Center, and trolley tours featuring the town's Victorian homes. Salina, Kansas Has the small, free Smoky Hill Museum and an excellent Zoo & Museum west of town at Rolling Hills Wildlife Adventure. The Kansas Fishes Exhibit at Central Mall is the largest free standing aquarium in Kansas. Indian Rock Park has 2 waterfalls. The Yesteryear Museum promotes regional agricultural and cultural heritage. Fredonia, Kansas - The 1872 Stone House is an art gallery is run by the Fredonia Arts Council. The Wilson County Historical Museum occupies a 1915 building that was originally the Wilson County Jail. Otto's Mill Falls is on the Fall River south of town. Fredonia Homecoming Parade Scammon, Kansas - Carona Depot and Railroad Museum is operated by the Heart of the Heartlands Railroad Club. Galena, Kansas - Galena is the Historic Route 66 entry to Kansas. Interesting stops include the Galena Mining and Historical Museum, Schermerhorn Park and the SouthEast Kansas Nature Center and 4 Women on the Route who are restoring a 1930 KanOtex filling station. Scandia, Kansas - The Scandia Museum celebrates the community's Scandinavian heritage and displays farm machinery, tools, buggies, war mementos, and primitive tools. Visitors will be impressed by the wood carvings by the late Allen D. Larson. Garden City, Kansas - With 300 animals of 100 species, the Lee Richardson Zoo is larger than most zoos in Kansas. The Finney County Historical Museum features permanent and revolving exhibits, educational tours and extensive research facilities. restaurants Scipio, Kansas - The limestone, St. Boniface Catholic Church was built by German immigrants in 1891, replacing an earlier wooden church. Always open. Gardner, Kansas - Gardner Junction Park is a two acre park which was opened in 2008 to commemorate a nearby location where where westward travelers split off the combined trails onto Santa Fe Trail, California Trail or Oregon Trail. 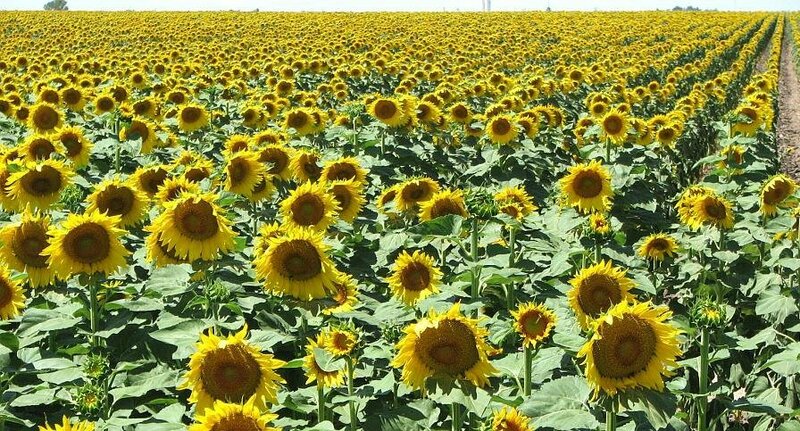 Scranton, Kansas - Lyndon Leaders 4H Club from Lyndon, Kansas has had public sunflower fields near Scranton since at least 2016. Garnet, Kansas - The Arthur Capper Memorial marks the site of the birthplace of Kansas first naive born Governor. Scott City, Kansas offers the free El Quartelejo Museum. The nearby Lake Scott State Park includes a 100 acre spring fed lake and the northern most Native American pueblo in North America. Battle Canyon was the site of the last battle between Native Americans and the Army in Kansas. This Restored Texaco Station is a free attraction. Goddard, Kansas - Until recently, Tanganyika Wildlife Park was a private zoo near Goddard. Tanganyika opened to the public in 2008. Lake Afton Public Observatory is open weekends. Sedan, Kansas - In 1967, Sedan, Kansas honored its most famous son with a celebration and the opening of the Emmett Kelly Museum. Visit beautiful Butcher Falls at the Red Buffalo Ranch, or the little waterfall at The Hollow park. Goessel, Kansas - The Mennonite Heritage Museum is part of a museum complex established to preserve the artifacts and history of early Mennonite farms, schools, churches and Bethesda Hospital. Sharon Springs, Kansas - Still Art Environment has the folk art of Fox Still. Goodland, Kansas - Giant Vincent van Gogh painting stands on an 80 foot easel. Part of the world wide Big Easel project. The High Plains Museum features a replica on the first patented helicopter in America. Drive by the nearby restored White Eagle Station and Gulick-Cooper House. Shawnee, Kansas - Old Shawnee Town is a seasonal museum complex.Shawnee Indian Cemetery has graves dating from the 1830s. Pioneer Crossing park opened in 2006. Shawnee Mission Park is the most visited park in the entire state of Kansas. Monticello Historical Museum includes a driving tour takes you to historic cemeteries, schools and the site where Wild Bill Hickok lived. Great Bend, Kansas - The free, Brit Spaugh Zoo is open 362 days a year, but the real treat is the metal, folk art of local folk artist, Bob Mix. Migrating birds may be seen in the spring and fall at the nearby Cheyenne Bottoms Wildlife Area and Quivira National Wildlife Refuge. Christmas Miracle Village is open weekends Thanksgiving to Christmas. South Hutchinson, Kansas - A new display includes picnic tables, several markers and the Salt Discovery Well where in 1887 Ben Blanchard found the salt that has contributed to the development of Hutchinson and Reno County. Greeley, Kansas - The 1856 Gerth Cabin was moved next to the 1915 Wagon Bridge over Pottawatomie Creek. The grounds can be visited anytime and tours are available by appointment through the Anderson County Kansas Historical Society. Spearville, Kansas - The 5,000 acre Spearville Wind Energy Facility produces 148.5 megawatts of electricity. Immaculate Heart of Mary Church is one of the most ornate churches in Kansas. Greensburg, Kansas - The Big Well is just one of the symbols of Greensburg's refusal to be eliminated by the 1.7 mile wide, EF5 tornado that devastated most of the community and left 11 people dead. The 5.4.7 Arts Center is an energy efficient work of art. St. Joseph, Kansas - St. Joseph Catholic Church is no longer consecrated, but the Guardians of The St. Joseph Church Foundation is preserving the beautiful 1910 brick church. Greenbush, Kansas - The St. Aloysius Church Historic Site in the unincorporated community of Greenbush (near Girard) has a church and a church ruins sitting almost side by side. St. Marys, Kansas - The centerpiece of the St. Marys Indian Pay Station Museum complex is the 1857 Indian agency building for the Potawatomi Indians, which was used as a Pay Station for payments from the United States Bureau of Indian Affairs. Grenola, Kansas - The Grenola Elevator Museum occupies an old grain elevator and two one room schoolhouses which were moved to the location. Strong City, Kansas - The 11,000 acre Tallgrass Prairie National Preserve is mostly owned by the Nature Conservancy, with just a few acres under the control of the National Park Service. Halstead, Kansas - The Kansas Learning Center for Health has health education programs, a museum and Valeda: The Transparent Talking Woman. Riverside Park was used extensively for scenes in the filming of the 1955 movie, Picnic, staring William Holden, Rosalind Russell and Kim Novak. Studley, Kansas - Cottonwood Ranch is a Kansas State Historic Site along US Highway 24. Hanover, Kansas - Built in 1858, Hollenberg Pony Express Station was a stop for the Pony Express and a way station for travelers on the Oregon and California Trails. Some people believe it is haunted. Sylvan Grove, Kansas - South Fork Spillman Creek Double Arch Bridge was built in 1908 with limestone rocks which were quarried in the nearby hills. Hays, Kansas - The Sternberg Museum of Natural History displays dinosaur & fish fossils from the area & life size recreations. Pete Felten's Stone Gallery is worth a special trip. Fort Hays has 4 19th Century buildings. The Ellis County Historical Society Museum is very nicely done. Boot Hill Cemetery is where gunfighters those who "died with their boots on" were buried. Tour the RANS Designs aircraft factory. Tonganoxie, Kansas - The Tonganoxie Community Historical Society Museum is a 4 building complex which includes a church and a schoolhouse which were relocated to the museum. Highland, Kansas - The Iowa and Sac & Fox Mission is now only open for viewing the grounds. The former Native American Heritage Museum, which operated in the mission, closed in 2008. Ulysses, Kansas - The Grant County Adobe Museum features historical artifacts and exhibits that tell the story of life on the High Plains. Hoisington, Kansas - At least twelve previously unmarked graves in Hoisington City Cemetery are marked with hand crafted folk art concrete and wire gravestones which were created by local grassroots artist, Phil Webb. Victoria, Kansas - The "Cathedral of the Plains" is St. Fidelis Church, just south of I-70 in Victoria, Kansas. Open free to the public 365 days a year, and serving mass each day. St. Fidelis Cemetery has interesting old iron "Volga" crosses. Howard, Kansas - The welded metal sculptures of Hubble's Rubble include odd vehicles, animals and cartoon characters. the 6 building Benson Historical Museum is open by appointment. Wallace, Kansas - The Fort Wallace Museum in Wallace, Kansas is pretty impressive for the size and quality of the museum in a town of only 56 people. Humboldt, Kansas - The Lewis R Howland Collection at the Humboldt Historical Museum has hundreds of scale models of horse drawn carriages and circus wagons. Other displays are devoted to baseball players George Sweatt & Walter Johnson. Since 1957, Biblesta is the October bible parade. WaKeeney, Kansas - The Trego County Historical Society Museum in WaKeeney, Kansas was dedicated in June 1975. The museum has grown twice - in 1997 when the Pleasant Valley School was moved to the museum grounds and in 2015 when a 7,200 square foot addition doubled the gallery space. Hutchinson, Kansas is home to the Hutchinson Art Center, Reno County Museum, Kansas Underground Salt Museum, Kansas State Fair, Hutchinson Zoo, Salt Discovery Well, Kansas State Mennonite Relief Sale, Memorial Park Cemetery, and the Kansas Cosmosphere and Space Center - a world class space museum with Apollo 13, Liberty Bell 7, SR-71 Blackbird, Imax, planetarium, and many Soviet space artifacts! Wamego, Kansas - The haunted Columbian Theater is a 1895 music hall which has murals and furnishings from the 1893 World's Columbian Exposition. The OZ Museum is devoted to the magical world created by L. Frank Baum. Independence, Kansas - The Independence Historical Museum fills 22 rooms of the former Post Office & Federal Building. The Ralph Mitchell Zoo has seen better days. A replica of the Little House on the Prairie 12 miles southeast of town may be the most famous attraction in the area. The Inge Festival brings together theatre professionals each April. Neewollah is the 8 - 10 day Halloween festival every October. Wellington, Kansas - The Panhandle Railroad Museum is a neat private collection of railroad memorabilia in an even neater old stone building which was a coal gasification plant from 1886-1906. The National Depression Glass Association opened their National Glass Museum in 2012. West Mineral, Kansas - Big Brutus near West Mineral was the world's second largest electric mining shovel when it was in operation in the 1960s and 70s. Now it is a tourist attraction. It is 160 feet tall and weights 11 million pounds. Junction City, Kansas - Milford Nature Center has hands on exhibits and many live animals, reptiles & birds. Fort Riley has museums & monuments, national cemetery, tours, flight & combat simulators, and the first capital of the State of Kansas. The Geary County Historical Museum occupies an attractive limestone building which opened as the Junction City High School in 1906. restaurants Weskan, Kansas - The highest point in Kansas - some people would describe Mount Sunflower as a barely noticeable rise in the middle of a field on a ranch 1/2 mile from the Colorado border. But they would lack vision. Kanopolis, Kansas - The Fort Harker Guardhouse Museum Complex is operated by the Ellsworth County Historical Society. Four buildings have been preserved from the fort which operated from 1866 to 1873. White Cloud, Kansas is known for the Four State Lookout and for its small monument to Wilbur Chapman who inspired the use of piggy banks to raise money for the American Leprosy Missions. Kansas City, Kansas - The Huron Indian Cemetery was started in 1843. St John the Baptist Catholic Church and the Strawberry Hill Museum and Sauer Castle are nearby. Kansas City T-Bones professional baseball. Quindaro was an important station on the Underground Railroad. Rosedale Arch is a WWI memorial. Jack Wyatt Piano Museum, Clendening History of Medicine Museum restaurants specialty food Wichita, Kansas - Attractions include Sedgwick County Zoo, Wichita Art Museum, Keeper of the Plains, Old Cowtown, Exploration Place, Botanica, Museum of World Treasures, Wichita - Sedgwick County Historical Museum, Cathedral of the Immaculate Conception, Sculptures and Carrie Nation Fountain, Kansas Sports Hall of Fame, Great Plains Transportation Museum, Pizza Hut Museum, Coleman Museum, Great Plains Nature Center, Ulrich Museum of Art, River Fest, Kansas Aviation Museum, Toy Train Museum, Steampunk Art Environment, Wichita WATER Center, Holmes Museum of Anthropology & Kansas Firefighters Museum. Kechi, Kansas - Karg Art Glass has a large gallery with art glass produced by many artists and a studio with many kilns where Rollin Karg's staff of artisans work. Williamsburg, Kansas - Pome on the Range Orchard and Winery near Williamsburg, Kansas offers produce, fruits, cider, baked goods, Kansas specialty foods and wines. Just off I-35. Kelly, Kansas - St. Bede's Parish organized in the fall of 1901. The first church was built in 1902, but he wood frame building burnt to the ground in 1913. The cornerstone of the present building was laid the same year and it was completed and dedicated on October 10, 1915. Wilmore, Kansas - Pull up to the carousel and honk your horn. If available, the Griffins or a neighbor come out to open and operate the carousel at no charge. Kingman, Kansas - The late Glenn Stark created art for over 60 years. The community has moved some of his work to a new Glenn Stark Park. The Kingman County Historical Museum occupies a beautiful 1888 building. Wilson, Kansas - The Czech Capital of Kansas has over 24 limestone buildings from the turn of the 20th century. Kansas Originals Market at I-70 exit 206 has products from over 500 Kansas artists, craftsmen, and food producers. Kinsley, Kansas - The Carnival Heritage Center is devoted to the history of the six carnival companies which once called Kinsley home. Winfield, Kansas - Walnut Valley Festival hosts international acts, championships for instrumental performance such as bluegrass banjo & old time fiddle, and well over 100 food, crafts and music venders. Lacrosse, Kansas - The Barbed Wire Capital of the World has four museums, side by side: Rush County Historical Museum, Nekoma Bank Museum, Post Rock Museum, Kansas Barbed Wire Museum. Yoder, Kansas - This small farming community south of Hutchinson is largely made up of Mennonite and Amish families. Yoder Meats sells many unusual cuts and types of meats. It is across the street from the Carriage Crossing Restaurant.